I come back to you in the new year with snark. We'll deal with the lack of posting later. Or maybe we won't. It's a blog for you. But it's a blog BY me, and I haven't had much time...plus there are internetty trends to which I subscribe that much of my work here is better suited to 140-character bits. Follow that here. Diners, Drive-ins, and Dives goes places. Some are amazing. Some you just kinda wonder. How'd they end up there. Tortilla Cafe in Eastern Market? Probably the latter. I didn't have their papusas or tamales, but that's not what's important. The Mexican breakfast burrito was tasty. The refried beans were tasty. The fried taters and onions were spicy and very tasty. I understand wanting to show off your brush with FoodTV fame (I guess). And the montage of four or five poster-sized photos of the staff with the host is...well, in a place that small, it's likely more than enough. Add the super-sized poster of the show with the host's John Hancock. Okay. We have approached overkill. 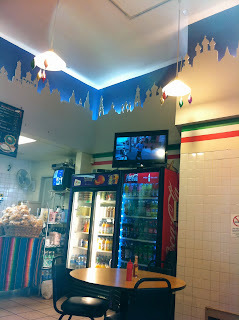 But the TV on top of the beverage fridge that plays the episode on which the show was featured...IN AN ENDLESS LOOP.